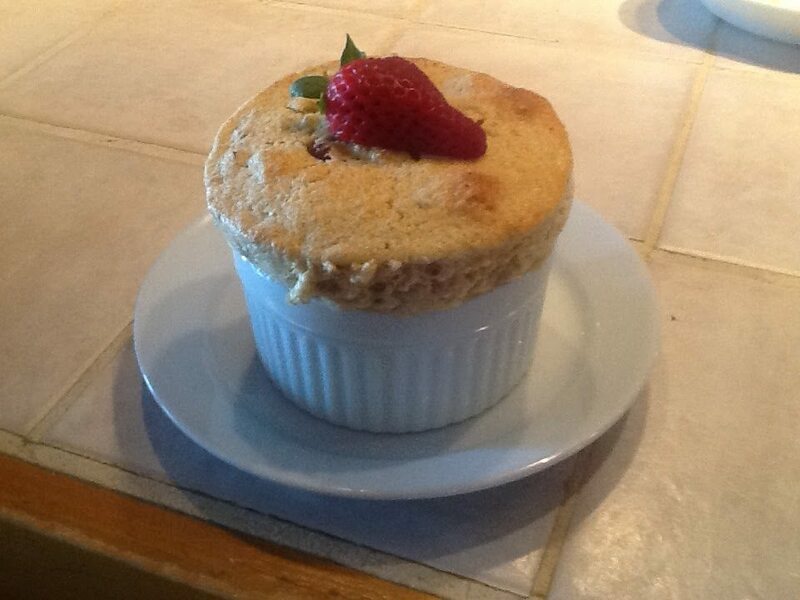 Within the past few days I have had several requests for this delicious Oatmeal Soufflé recipe that is served at breakfast so I thought I would post it on Dave’s blog. 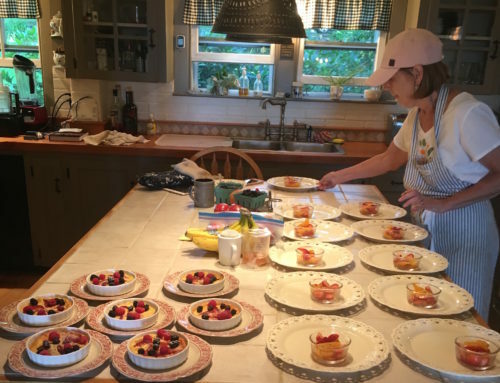 I like to make this soufflé when we only have a few guests because, as you might guess, it can be difficult for me to get the presentation correct if Dave is busy chatting and the oatmeal soufflé is deflating on the kitchen island. Dave entertains and serves the guests each morning, while I do the preparation for breakfast. This is an easy recipe and would be great even if it deflates. I think it would be wonderful served to family / friends on Christmas morning. I have served this recipe with dried cranberries / pecans or Maine blueberries or raisins / walnuts. I hope your family enjoys this recipe as much as our guests do. Preheat oven to 325ºF. Butter a 1 1/2 cup soufflé dish / casserole or 4 small soufflé ramekins (I use ramekins at Timbercliffe) and sugar the sides with granulated sugar. Place the milk and butter in a saucepan and heat until barely boiling. Add the oatmeal, reducing heat to low and stirring often until oatmeal is thick. Remove from heat and add the cream cheese or ricotta (I use fresh ricotta), salt, brown sugar, nutmeg and cinnamon. Whisk until mixture is smooth. Beat 3 egg yolks slightly, temper them with a small amount of the oatmeal mixture, and slowly stir them into the oatmeal. Mix in the raisins and walnuts, if using. Beat 3 egg whites until stiff, but still moist. Gently fold the egg whites into the oatmeal mixture, being careful not to deflate whites. Fold only until no large lumps of whites remain. Spoon the mixture into the prepared soufflé dish(s); run your thumb-tip around the edge of the dish to create a small channel around the souffle base, which will encourage it to rise straight. Bake for 30 minutes or until the soufflé is set but the center still trembles. Serve immediately as the soufflé will deflate. Enjoy!